1998 Marin Team down hill factory bike pictures ? The brake bosses really bug me. It's their top of the range DH team bike, and is running discs. Why would they need the v brake bosses? And if leaving them on, why not use blanking bolts to stop them looking so ugly? I think mine has blanking bolts ? Dont know about the picture tho ,just laziness i suppose ,i was i was told that very few of theses teams was sold/made, so maybe the bollock ache to not have them fitted or removing them was not justified on such a low production run maybe !? My production bike has the blanking bolts tho . What's going on with the granny's saddle?! I had a set of these forks a while ago, nice bike mate. Reading that catalogue page I'm now curious as to how the main frame is "downhill spec" exactly, it's either some serious artistic license or there are actually some under the skin differences on this and the DH FRS frames after all? When i bought mine back in 1998 it to was fitted with a solid single front chain-ring and chain device made by coyote i think it was called ?, it came with the the front xtr mech, xt changer,and three chain rings in a bag which i decided would be better fitted for how i was gonna ride it so i had it put on. As for the difference in rear travel between the frame and the Team bike ,i don't know if there is any difference or not !? We know the team bike comes with 6 and a half inches of travel at the rear,wasn't the rest of the range was 6 ?? maybe it was the fox shock gave a bit more ? I have the front and rear frame sections for one of these, I've just had them powder coated but need new pivot bolts and the main pivot, anyone know where to get them??? What frame is it and what model ? I have some spares from a b17 FRS/mount vision ? If you pay for postage you can have the pins for free ,i will get the mrs to post them ,but these pins are different than whats on my Team DownHill frame for some reason. 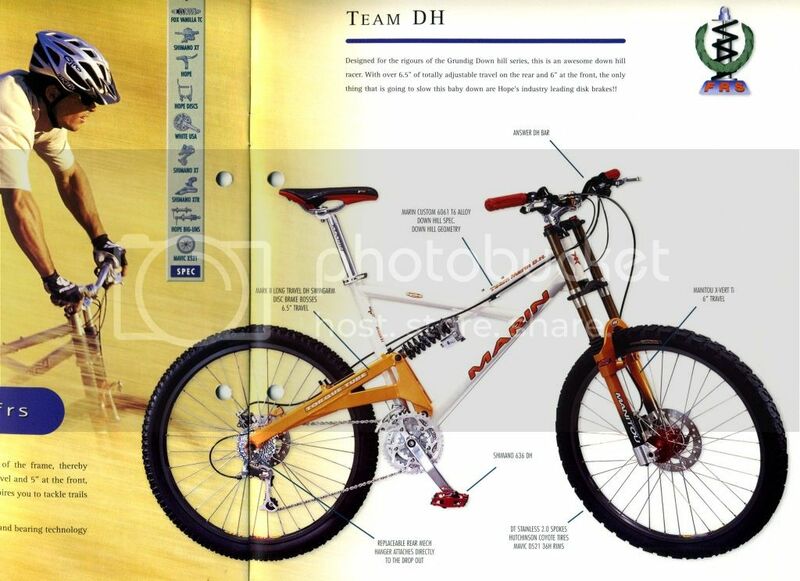 Post subject: Re: 1998 Marin Team down hill factory bike pictures ? File comment: very old photo!